Buying a vehicle at an auction can be fun, but not a lot of people are familiar with the process. Since I’ve done it, let me share the steps it takes to buy a car at insurance auto auctions. Find an auto insurance auction that sells newer cars where the public is allowed to attend. Most auto insurance auctions are run for dealers only, but some are open to the public. 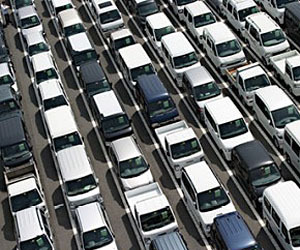 Vehicles at an auction are generally ex rentals, off lease, repossessions, or government vehicles. Mine was a trade in being sold by a dealership. A quick google search for “your area or city + public + auto auction” should do the trick to find an auction in your area. Check out the vehicles at the auction house. There should be a pre viewing session for the auction the day before. At the pre viewing, you can start the vehicle but you can’t test drive it. Do all the things you ordinarily would when buying a used car : check underneath for fluid spills, pop the hood, bring a friend that knows more about cars than you do. Do your due diligence on handful of vehicles you want. Check out nadaguides for the ( U.S. ) book value. Check out auto forums on your selected models for personal experiences. Ideally, go to one or two auctions just to get a feel for how the bidding goes. Usually they’ll start off with a fairly high number stated by the auctioneer. Do not jump in then. In my case, nobody was putting out the first bid for a couple of minutes, which felt like hours, and the auctioneer finally asked for a starting bid. I put out $5,000 to start. In hindsight, I wish I hadn’t because it seems like the first one to open their mouths always loses. But if there’s no starting bid, the auctioneer will let the vehicle go without bidding since they’re moving through these vehicles at a rate of about 15 per hour. Watch the mood and trend of the crowd in the bidding before your vehicle comes up for sale. I’ve noticed that at auctions there are frugal crowds and there are spendy crowds. I don’t know why this is. I’ve seen furniture, tools, and kitchen cabinets sell for 10% of retail. But I’ve also seen them sell at what you’d pay for full retail in a store at the same auction house on different days. There doesn’t seem to be any rhyme or reason to it. Always be prepared to walk away. There’ll be another auction in a week or two. Stick to your guns on your price. Really. It’s easy to get caught up in the bidding at an auction. It’s almost like they can put you into a suggestible hypnotic trance state. Get an inspection done at the auction house, if it’s available. That’s a buyer protection plan for major components. If there’s anything wrong, you can go into arbitration and the seller can lower the price or you can choose not to take the vehicle. If you buy a car at auction, you have to put a deposit down on the day of sale. You then have to make full payment on the next business day.